Ladies and gentlemen, light your grills. The Fourth of July is headed our way and with it come suped-up picnics, patriotic desserts and the need for festive and thematic menus. If you’re scratching your head wondering how to make this year scream “America the beautiful” or “Home of the brave,” then give some of these recipes and crafts a try. Whichever one(s) you choose, you’ll earn your stripes for a perfectly coordinated party or a masterful hostess gift. If you’re down to the wire and only have some packages of hot dogs and hamburgers, this DIY party favor is the perfect solution to add a custom pop of patriotism of your Fourth of July bash. 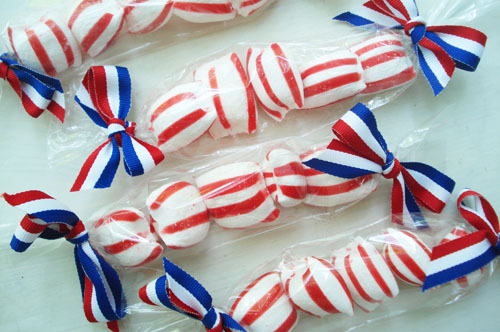 All you need to do is gather some clear cellophane, red, white and blue ribbon and peppermint candies (really any white and red striped candy). Then, you can simply cut the cellophane to size, slip five to seven candies inside the tube, tape the plastic shut on the seam, twist the ends together and tie on gorgeous bows that represent the American flag. You can even make these more custom to your style and taste by choosing star themed ribbon fabric or using wrapping twine in silver and gold metallics. The choice is up to you with how much pizazz you’d like to put into these beautiful party gifts. Why choose one America-inspired candy when you can serve up a ton on a stick? These Fourth of July candy skewers are an incredible display of red, white and blue as well as great flavors, textures and style. The best thing about this dessert table addition is that you can tailor it to your favorite candies and aesthetic. In this particular skewer display, the master chef chose a variety of gummy rings, star-shaped marshmallows, gummy ribbon candy and then filled the bottom of the bucket with red and blue M&Ms. You can follow suit or choose different types of candies that still pack the punch of a grand finale firework display. 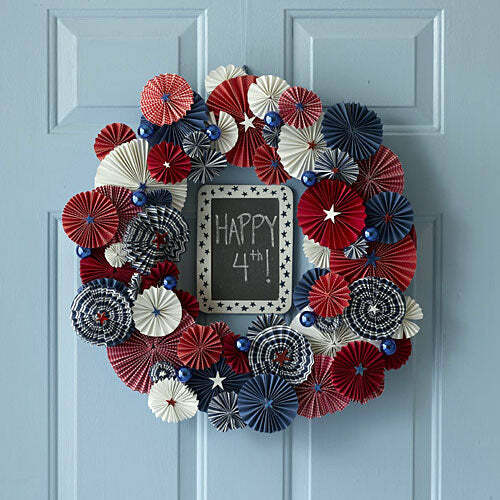 This wreath may look pretty complex, but with a few supplies and some hot glue, you’ll delight every person who comes knocking during the month of July! For this featured wreath, the user used scrapbook paper. However, we think it would be even easier to attain this crinkled and custom look by flattening out cupcake liners! Your local party store should have an array of prints and red, white and blue solid colors, but if they don’t then why not try shopping online for exactly what you’re looking for? If you’re up for the challenge, use these directions to find out how to make the pinwheels from scratch. To affix the pinwheels to a wreath and get them ready to hang on your front door, follow these. Who doesn’t love a sweet that is wearable and thematic? We certainly don’t know who could resist. And this particular Fourth of July candy idea is a real stunner in our eyes. 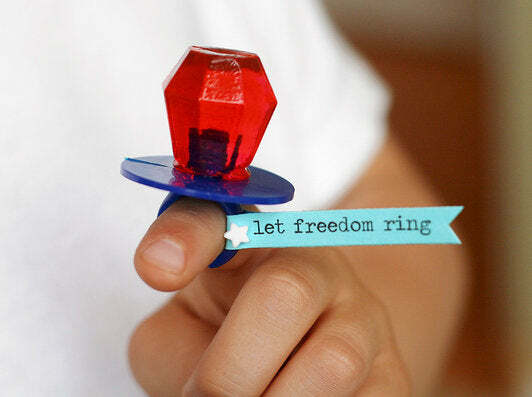 Since all you have to do is order Ring Pops (any flavor or a mix of blue, red or clear!) and stick on a custom label, these little treats are a great last minute idea to spruce up a dessert table or to give out when your guests arrive. You can set out a star spangled display, wrap them up individually in cellophane baggies or even create custom ring boxes for them. Whatever you like, these will shine and stun on the dinner table as place settings or set out by dessert. Make a dessert that will remind all of your guests about the day American won our independence and that will make them ask for seconds. 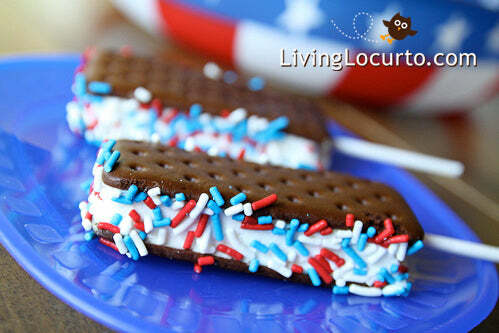 With these adorable and delicious ice cream sandwich pops, you’ll certainly do both! Ideal for those who like to skimp on the effort but never on the style, these sweets take a short amount of time to assemble and can be done days in advance. With a few boxes of ice cream sandwiches (amount depends on your guest count), popsicle sticks, cupcake liners and red white and blue sprinkles, you’ll be ready to go. Cut the ice cream sandwiches in half, let them thaw a little bit (one to two minutes) so that the ice cream is wet and the sprinkles will adhere better, then, insert a popsicle stick and roll the outer edger in sprinkles. Rest each one on a flattened cupcake liner, spread them on a cookie sheet and pop them back in the freezer. They’ll be ready to eat whenever you are ready to devour them! Candy apples usually don’t make their debut until the days are shorter and the air is crisp. That’s why we think this Fourth of July variation is so fabulous! 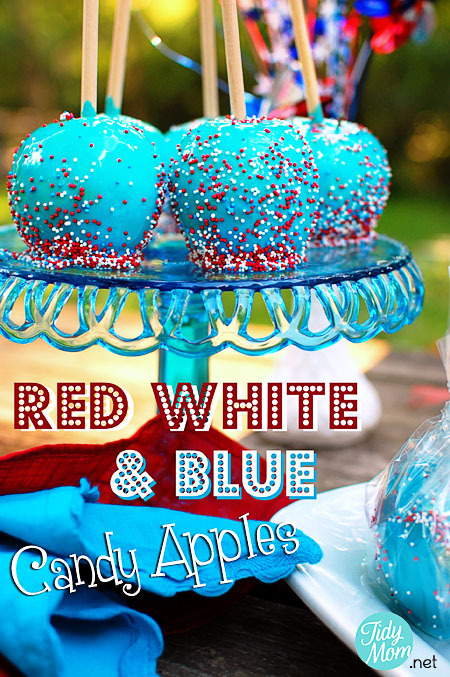 With an inventive take on an autumn classic, these blue candy apples with their red, white and blue sprinkles are an incredible Fourth of July dessert your guests will marvel at. This is more involved than some of the other DIY ideas, but with a delicious flavor and beautiful look, they’re worth the extra effort. Find the full set of directions here. If you’ve got enough sugary sweets on the menu, then this light and healthy trifle is something you might be interested in. 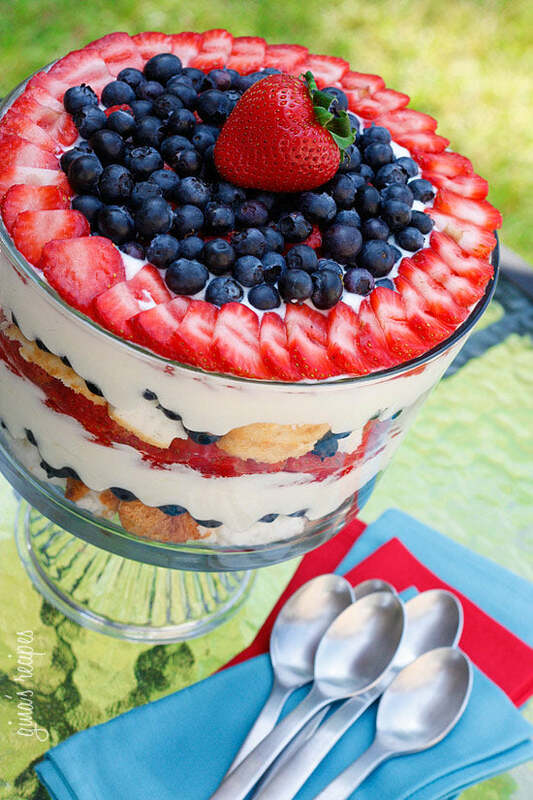 Topped with fresh blueberries, cut strawberries and a whole berry in the center, it screams the Fourth of July from first glance. The beauty of a trifle is that you can see every layer. And with these levels of whipped cream (or yogurt if you’d like to make it even healthier), angel food cake and berries, it’s a beautiful site to see on the dessert table. Make it yourself by following these directions. Send your guests home with smiles on their faces after you detonate these handmade rocket poppers! 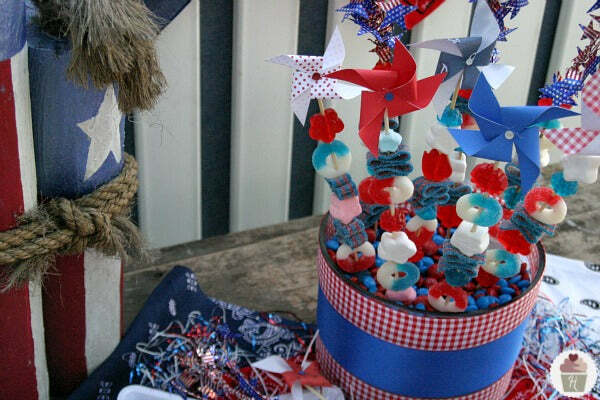 Filled with paper confetti (or confetti stars), they’re the perfect craft to give your Fourth of July picnic or party the grand finale you’ve dreamed of. Alongside sparklers and other fireworks, dole these fun rockets out to your guests and have the pop them open to rain confetti down on the entire party. 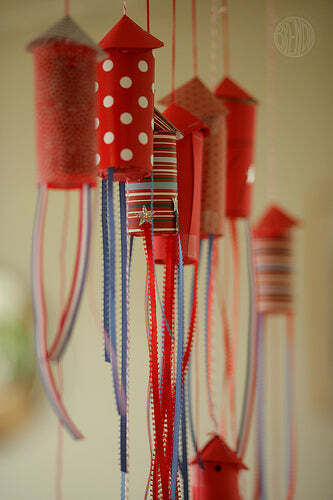 Find out how to make these amazing decorations here. Thanks for including our candy skewers! They are so awesome, Liz! Happy 4th of July!